The Games on Demand version supports English, French, Spanish. 1974 The Peace Walker Incident The era is the 1970s. Big Boss has stationed his "Army without a Nation" in Colombia, South America, where he is approached by visitors from Costa Rica-- "a Nation without a Military." In the wake of the Cuban Missile Crisis, Latin America became key to maintaining the power balance between East and West. But now, a mysterious armed force threatens to disrupt this balance. To preserve peace and neutrality in Costa Rica, the "Soldiers without Borders" move into action. In time, they would come to be known as the founders of "Outer Heaven." 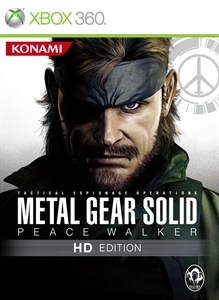 Prepare your avatar for the MGS HD Collection and play in style! Prepare your avatar for the MGS HD Collection and show your support!